Kidderminster Harriers hit two second-half goals to end Cambridge United's automatic promotion hopes and kept their own play-off bid afloat. Amari'i Bell's first goal for Harriers and Michael Gash's 25-yard screamer ensured that Luton Town will take this year's Conference Premier title. Young Birmingham City loan man Bell's 15-yard left-foot snapshot ricocheted in to earn Harriers a 67th-minute lead. 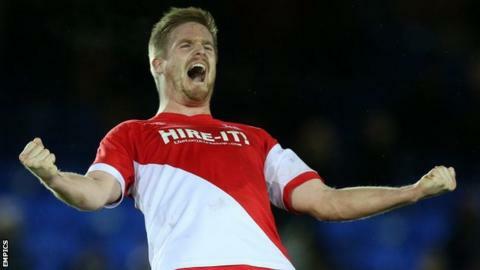 Michael Gash's 14th goal of the season against his home-town club maintained Harriers' hold over the U's at Aggborough. They have only ever won once in their 13 visits to Worcestershire over the last 12 years. Gash then powered home a stunning right-foot volley 10 minutes later. It also extended the Harriers' run of just one defeat in 10 games since Gary Whild took charge in early March, following Andy Thorn's sacking after the 5-1 defeat at Cambridge. Whild's men are now five points adrift of the play-offs with just three games left. Richard Money's Cambridge, who ended run of four straight wins, had only one worthwhile effort - a Tom Champion shot early in the second half which brought a flying save from keeper Danny Lewis. "The lads were terrific and acquitted themselves really well. Nathan Blissett and Michael Gash were outstanding. I thought the two of them were a menace. "The three points are massive. Cambridge are the form team in the division and they've been on fire. "We're very much under the radar. We go to Hyde before having Nuneaton here in a derby. And they are two absolutely critical games. "If we could go to Halifax on the last day with something to play for and a chance of getting into the shake-up then that's our aim." Match ends, Kidderminster Harriers 2, Cambridge United 0. Second Half ends, Kidderminster Harriers 2, Cambridge United 0. Substitution, Kidderminster Harriers. Nick Wright replaces Michael Gash. Offside, Kidderminster Harriers. Nathan Vaughan tries a through ball, but Nathan Vaughan is caught offside. Substitution, Kidderminster Harriers. Aman Verma replaces Callum Gittings. Goal! Kidderminster Harriers 2, Cambridge United 0. Michael Gash (Kidderminster Harriers) left footed shot from outside the box to the top right corner. Substitution, Kidderminster Harriers. Nathan Vaughan replaces Nathan Blissett. Attempt missed. Josh O'Keefe (Kidderminster Harriers) right footed shot from outside the box misses to the right. Cheyenne Dunkley (Kidderminster Harriers) is shown the yellow card for a bad foul. Goal! Kidderminster Harriers 1, Cambridge United 0. Amari'i Bell (Kidderminster Harriers) left footed shot from a difficult angle on the left to the bottom left corner. Assisted by Jack Byrne. Substitution, Cambridge United. Luke Berry replaces Tom Champion because of an injury. Cheyenne Dunkley (Kidderminster Harriers) wins a free kick. Substitution, Cambridge United. Harrison Dunk replaces Delano Sam-Yorke because of an injury. Second Half begins Kidderminster Harriers 0, Cambridge United 0. First Half ends, Kidderminster Harriers 0, Cambridge United 0. Attempt saved. Matthew Barnes-Homer (Cambridge United) right footed shot from the right side of the box is saved.